When people engage in service, it leads to life change. God calls us to serve one another. The impact of that service will change lives for those serving, for the people they serve, and for those seeing service in action. God has entrusted each of us with distinct gifts and resources. Central wants to help you discover those gifts and offer them fully to God by serving both inside and outside the church. Central’s youngest attendees begin their Children’s Ministry journey in Sprouts, with separate classrooms for infants and toddlers. All activities are age-appropriate with plenty of flexibility to meet children’s needs while teaching them basic truths of the Bible. In The Backyard, preschoolers discover the wonder of God’s love through creatively-told Bible stories, crafts, games, and music that center around a monthly theme. Route 45 helps preteens navigate life at a time filled with transitions and increasing independence. Students have opportunities to personalize their faith by going deeper during small group activities, prayer, and conversation. Whirlwind is a high energy environment where middle school students can build lasting friendships and wrestle with what they believe. Middle school students gather for games, age-appropriate teaching, and breakout groups..
Storm meets Sunday nights throughout the school year. They play games, hear practical teaching, enjoy student-led worship, and connect in small groups. The Mosaic Worship Team strives to plan and implement transformational worship services that honor God and build up his people. Our team consists of all volunteers needed to make Central’s Mosaic Worship service happen, including pastors, planners, band members, technicians, hosts, and ushers. Traditional Worship at Central provides worship opportunities for those who find acoustic music of a more traditional worship style conducive to praising their God. This includes Chancel Choir, the bell choir, and special concerts. Serve our outreach partners by cooking or serving a meal. Serve with outreach partners through formal and informal mentoring. Welcome guests and connect people with what is happening at Central. Be a part of the team that helps to setup and serve coffee at Central on Sundays. Be a welcoming embrace for everyone who attends worship. This is a team of people that personally contact and follow up with each guest that fills out a Connection Card on Sundays. This team works to warmly welcome guests, answer questions, invite them to upcoming events, meet other people and more. Central’s Growth Path is a series of environments designed to encourage everyone to take the next step in your spiritual journey. We are always looking for volunteers to support these environments. What ministry are you interested in serving with? The Growth Path is designed to assist you in getting connected and involved here at Central. Week three (Serve Potential) is specifically designed to help you identify how God has uniquely gifted you to serve others. 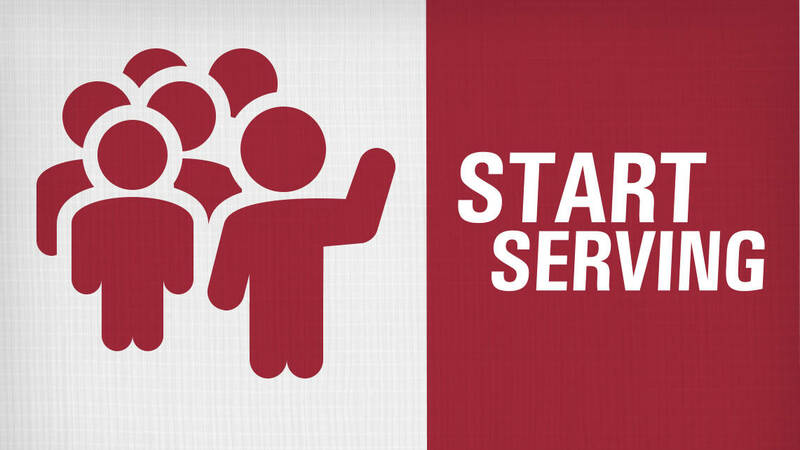 Let us know know what ministry you would like to learn about serving with by filling out the “Start Serving” form. Don’t worry, you will have all the time you need to make sure the ministry you selected is a good fit. After submitting your information, you will be contacted by a ministry coordinator. Their primary goal will be to offer any information you may need about the ministry you wish to serve with. After receiving your information a Ministry Director will contact you to setup a time for you to observe the ministry you are considering. After observing, if you are ready to take the next step then you will begin the process of serving. For each ministry this looks different. For example, serving in Children’s Ministry requires a background check.